To view all coupons, navigate to Marketing > Promotions > Coupons in the main menu. 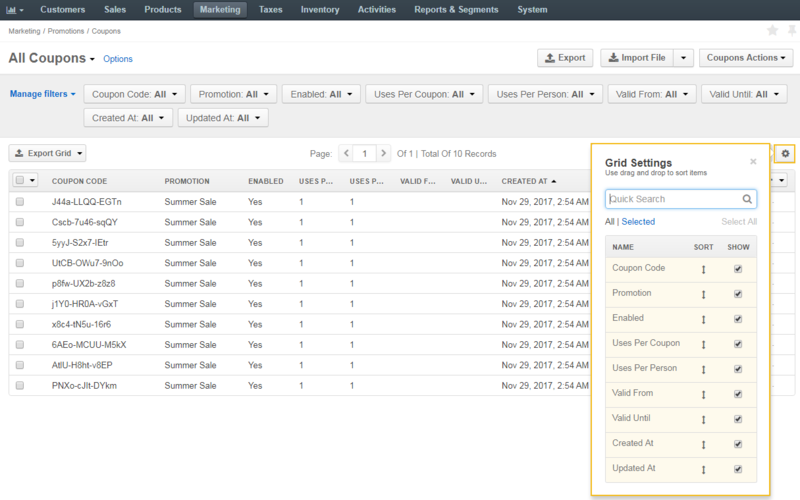 Create a new coupon: Click Coupons Actions > Create Promotion on the top right. 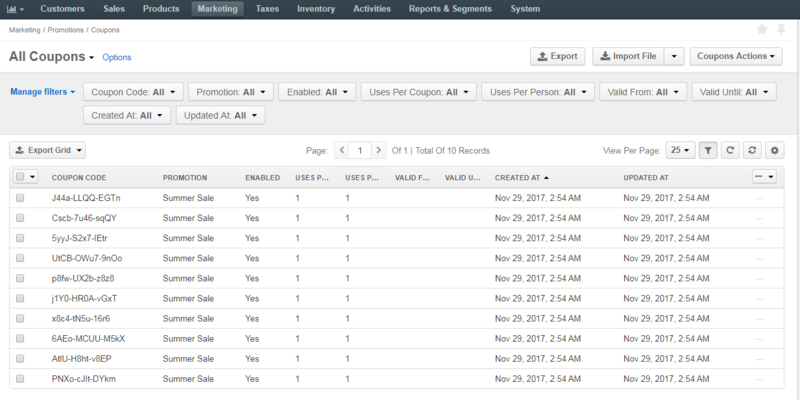 Generate coupons: Click Coupons Actions > Generate Multiple Coupons on the top right. Export coupons: Click Export on the top right. Import coupons: Click Import on the top right. View coupon details: Click on the item from the list to open its details page. Alternatively: Click the icon to the right of the item to open its details page. Filters are hidden by default. To show filters, click above the table on the far right. To refresh the coupon list, click . To reset the coupon list, click to clear list customization and return to default settings. Reset applies to all filters, records per page and sorting changes that you have made. View coupon details: Click to the right of the item to view its details. Edit coupon details: Click the to the right of the item to start editing its details. Delete a coupon: Click to remove a promotion from the system. Select the check boxes on the left of the corresponding rows. The selected coupons will be highlighted in yellow. Click Edit to edit, or Delete to delete the selected coupons.